Many people choose to use worms to help in composting. Worms are very efficient and can help a lot, so it's not surprising many gardeners choose to "employ" them to do some composting. Many people choose to use worms to help in composting. Worms are very efficient and can help a lot, so it’s not surprising many gardeners choose to “employ” them to do some composting. However, as effective as they are, worms are living beings and they need some guidance. To get the best results and some targeted worm power, it’s important to set a specific location for the worms to work and to give them exact materials. 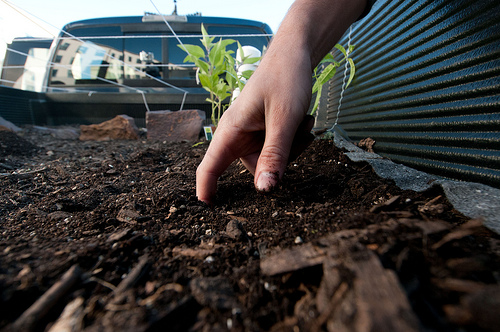 Given these beneficial conditions, the worms will grow strong and work hard on your compost. The most effective way to employ worms is by using the so called “worm towers”. Worm towers offer numerous benefits for gardeners. When installed in the garden, they will easily attract worms and make them stay. A tower will provide food for worm and in turn they will leave their worm casings behind. These casings can be used to fertilize the soil on the deep down, which is very beneficial since this is where fertilization is needed the most. This is just one of the many techniques permaculturists use, but it’s very easy and handy, so it’s suitable even for beginner gardeners. This is a very simple and clean way to dispose kitchen waste and improve quality of your garden soil at the same time. The towers are filled with food waste, which worms eat and in turn, fertilize the garden soil. This is a handy method because you won’t have to deal with kitchen scraps anymore. Worm towers are very easy to use and the only maintenance you need to perform is to clean out worm castings one per year so you can make more room more compost. Take a PVC or a plastic tube and drill a bunch of ¼+ inch holes into it. The holes are needed so the worms can freely move in and out of the tower. The best tubes are around 2-2 ½ feet long and 4 to 8 inches in diameter. Make sure to drill on a tarp or bed sheet so you can catch bits of plastic. Prepare a hole in the ground where you want to position your worm tower. Make sure to bury all the tube so only 4 to 6 inches remain above the surface. You should back-fill around the tube but not in it. When you’re installing the tube, make sure that all of the holes are below the ground. Make a cover. It can be anything, from a piece of window screen to a flower pot. You can use many different materials for a lid. The exact shape or size is not important – the cover is there only to protect the tower from flies. Fill the tube about half-way up with a special mix of various organic materials. Good materials to use are leaves, straw, shredded newspaper, and all kinds of kitchen scraps. Make sure that the materials you add is moist. This will provide the food and bedding for the worms. Alternatively, you may try to make a worm tower out of a 5 gallon bucket. Drill a bunch of holes in it and sink it into the ground. You may even try to make one out of a terracotta tray, though in this case make sure to have a bigger lid. Once installed, a worm tower does most of the job itself. All you need to do is to add composting worms. The best worms to use are red wigglers. This is all you have to do: just leave them in the tower and let them do their job. You might want to add some table scraps occasionally, to provide worms with some extra meal from time to time. If the weather is dry, don’t forget to add some water to keep the soil and worms moist. During winter, the top of the tower might be frosted, but don’t worry about it. Beneath that layer there are still active worms doing their thing.